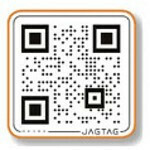 JAGTAG is a barcode scanning company which is the maker of QR Codes, a way for all phones to receive multimedia content after snapping a picture of the bar code. It's not all that innovative - you take a picture of the bar code and MMS it with your feature phone to a JAGTAG provided number if you are on Verizon or AT&T, or email it if you are on another network. JAGTAG then reads it on its servers, and returns back to your inbox the content it is supposed to represent. Still, if you don't have a QR code scanning app on your smartphone, or have a feature phone, that is a relatively easy way to get your barcode game on. Plus JAGTAG is optimizing the multimedia content for your specific brand and model, if needed. Marketing campaigns can go wild with QR codes, knowing that feature phone users can read the bar codes too now.